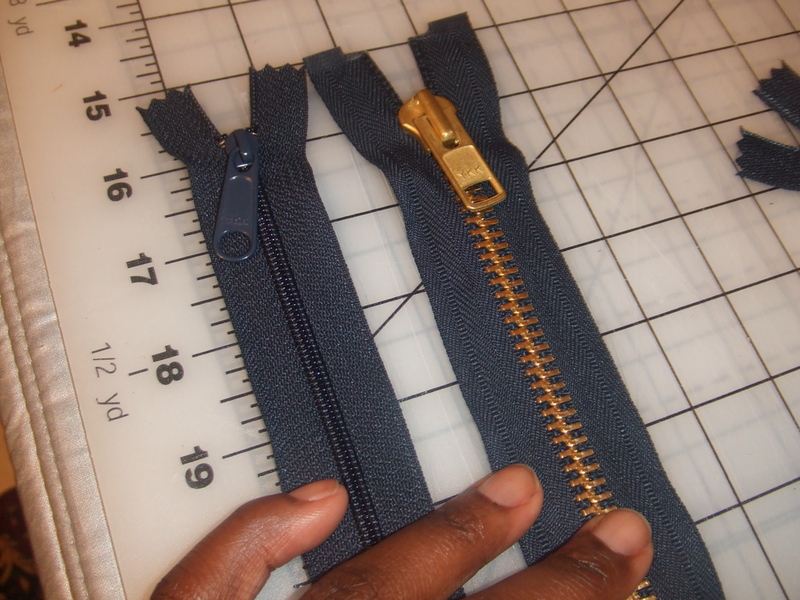 This is a 32 inch separating zipper in navy with an amazing brass tone and the ginormous pull. It was $4.75 from them. I’m going to use it on the Weekender bag (shortened to non separate). I think what’s got me so stoked is that this looks like the kind of zipper you would find on a high end bag. Sturdy, nice color, great pull. No more Coats and Clark for me I say! Below is the photo next to their ‘handbag’ zipper. Both have longer pulls. Yep. It’s me an Zipperstop from now on. They did FedEx my order to me and I received it two days after I called them. So, I’ll definitely use them again. 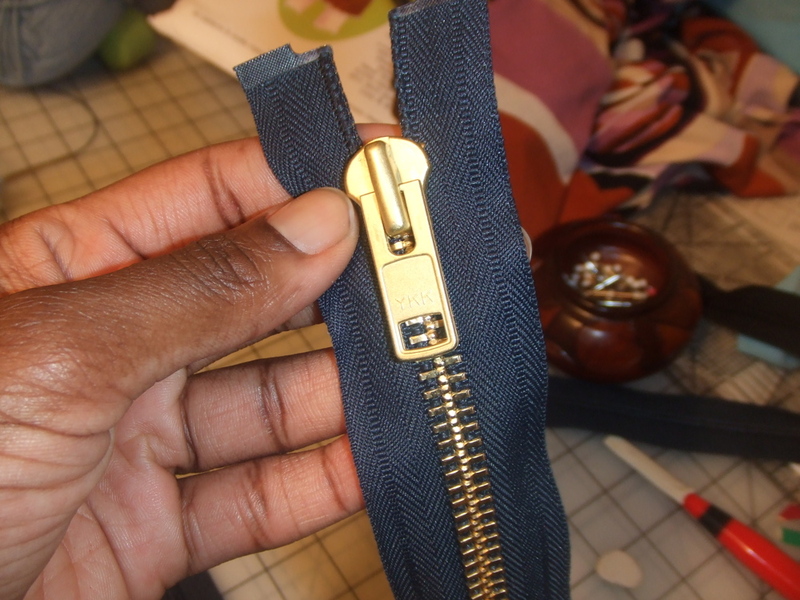 They have the 2 way separating zipper I’ve been dreaming of for a jacket that is like 30th on my list of things to sew. My one purchase from the craft show today was this way cool yard stick from a furniture maker. It’s made from cherry wood and is about 1/2 inch thick. Super sturdy and kind of pretty. And, here’s a peak at my current summer dress project. As I mentioned, it’s basted for fit. Hopefully I’ll get to it next week. Ah, also, I now officially have my own domain. Just type in MissCeliesPants.com (you don’t even need the ‘www’) and you’ll wind up here. O*M*Gosh! I truly adore the way you used the fabrics, love it! Congrats on your own domain, too cool! Oh YES. Zippers matter. Big time. See that comma in my previous post (after domain) Cidell? It means I’m up too late. Off to bed now. 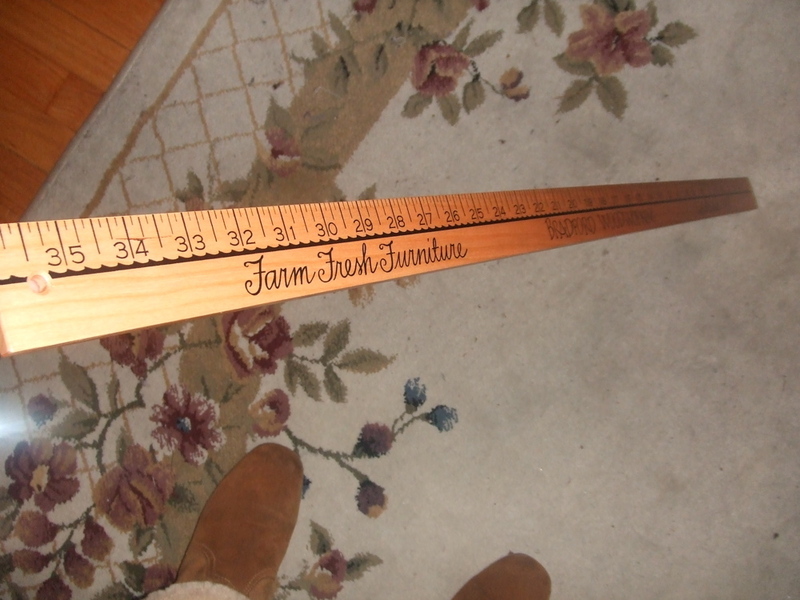 If I had that gorgeous yardstick, I would hang it on the wall as a decoration. Not that you have to, but I would. Can’t wait to see the whole dress! I cannot WAIT to see that dress! The color combination is wonderful! I love your dress. The fabrics are gorgeous! You make the cutest sundresses, Cidell. I love your color/print combos. That is going to be so cute! Love Love Love Zipperstop! Any color you want, any length you want, any style you want! If you don’t yet have one, I recommend you purchase one of their color cards. It makes ordering (always by phone…) a zip! ooh-love the colors and patterns on the dress. I love zipperstop! I bought their color card when I was making my SIL wedding dress, to find the perfect color. They are a great resource. OMG, I had a panic attack when your blog disappeared! I’m so glad I found your new site, whew. That zipper looks beautiful. I have some Riri zippers waiting for just the right project. I really like those zippers. I am especially loving the clothing I have been seeing with exposed zippers. It’s a great zipper, pity it came so late. Well worth the waiting (apart from being too late for the contest, which really is a pity). 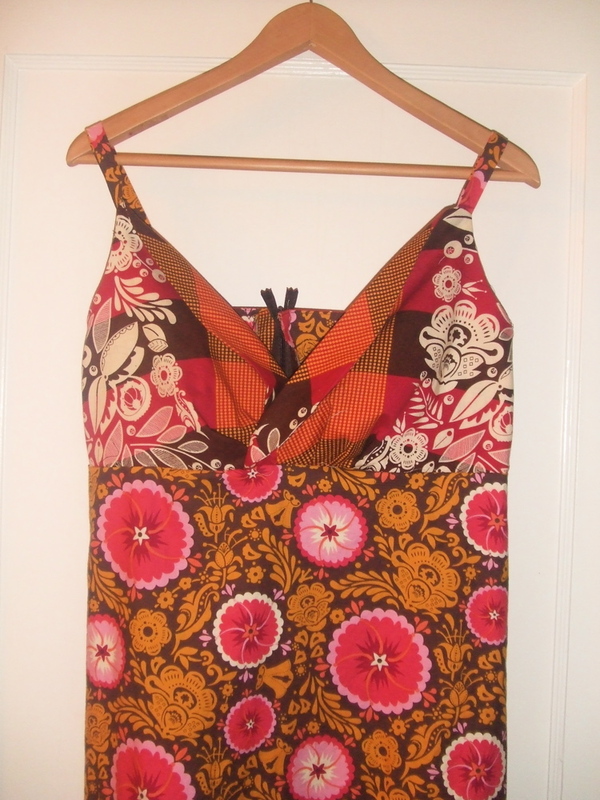 And the sundress: gorgeous, wish it was time to wear something like it. Great zipper! Thanks for the recommendation — I’ve been looking for new places to get zippers! You can never think too much about zippers, after all they can make or break a garment, literally. The sundress looks wonderful! I love zipperstop! I have ordered from them. At one point, I ordered 18″ zippers, they didn’t have any, and called to ask if I’d like 22″ zippers. Hell, yeah! I can cut off the extra 4″ if need be! Love your new dress; I can’t wait for springtime, either! Wow, I love the pull on that. It just looks sturdy. Yay for zipperstop! Ooooh, love the dress! The colors! The brightness! The spaghetti straps! I need it to be warm.